MegaPlayer is the PUP that uses misleading techniques to prevent removal. Use Reimage to locate malicious components and get rid of them faster than with uninstall instructions. A full system scan blocks virus reappearance and prevents traffic to malicious domains. What is MegaPlayer and what is the function of it? Is it possible to remove MegaPlayer without an anti-malware program? Have you recently installed MegaPlayer? Have you noticed intrusive ads that claim to be powered by MegaPlayer while you browse the web? Alternatively, you did not install such program, and now you are wondering where these advertisements come from? If so, we are going to explain everything about this program and its ads for you. MegaPlayer can be downloaded from its official website, however, what typically happens is that such potentially unwanted programs (PUPs) are spread with a help of bundling method. MegaPlayer is exactly this kind of a program. The developers of PUPs tend to bundle their apps with other applications that are normally lawful and reliable-looking. This is why you have to be attentive when you install new programs. Otherwise, you may end up with computer parasites on your system. It is an effortless task to ensure your system’s safety – all you have to do is to be more cautious when installing free programs. You can quickly find out if there are any extra software attached to your preferred program. When you launch the installation of it, opt out the “default” and “standard” installation modes and choose “advanced” or “custom” settings instead. You should see an expanded window now, where you can manage the components of the software. Untick all items that you do not want to install and click “finish”. 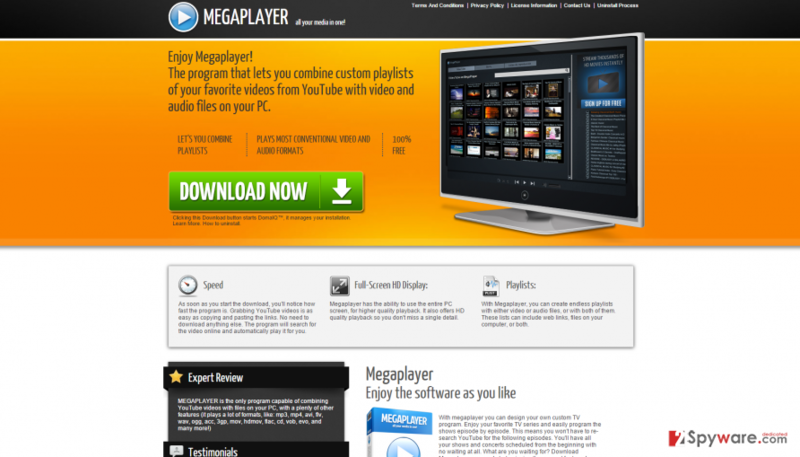 MegaPlayer’s official website claims that this app is a useful tool that allows to combine custom playlists of your favorite videos from YouTube with video and audio files on your PC”. However, it is just another adware program, and it means it is designed to advertise something. This program will flood your screen with “ads by MegaPlayer”, “MegaPlayer ads”, “brought to you by MegaPlayer” or similarly entitled advertisements. However, do not be tricked by the content of these ads – most of them could be deceptive. No matter what such ads promise you, you should remember that they are sponsored by third-party websites that endeavor to promote their web traffic. Moreover, some of these websites can contain infectious material, so we recommend you to avoid clicking on Megaplayer ads. You should also know that this program is capable of collecting information about your browsing habits – for example, which websites your visit the most, what keywords you enter in search engines and so on. It is even capable of finding out your IP address and your computer’s approximate location. Do you wonder why this program needs such information? Well, this PC intruder uses it to predict your interests and then generates advertisements mentioned above. If you think that removing this suspicious software would be the best choice, we recommend using Reimage anti-malware. Yes, you can delete MegaPlayer on your own, and you can use the instructions on how to do it that are provided below this article. However, using a professional removal tool is more than recommended. Potentially unwanted programs usually diffuse their files all over your computer, so if you are an inexperienced PC user, it may be hard to detect each component of this program. Here, look for MegaPlayer or any other recently installed suspicious programs. Wait until you see Applications folder and look for MegaPlayer or any other suspicious programs on it. Now right click on every of such entries and select Move to Trash. When in the new window, check Delete personal settings and select Reset again to complete MegaPlayer removal. Once these steps are finished, MegaPlayer should be removed from your Microsoft Edge browser. Here, select MegaPlayer and other questionable plugins. Click Remove to delete these entries. Now you will see Reset Firefox to its default state message with Reset Firefox button. Click this button for several times and complete MegaPlayer removal. Here, select MegaPlayer and other malicious plugins and select trash icon to delete these entries. Click Reset to confirm this action and complete MegaPlayer removal. Here, select Extensions and look for MegaPlayer or other suspicious entries. Click on the Uninstall button to get rid each of them. Now you will see a detailed dialog window filled with reset options. All of those options are usually checked, but you can specify which of them you want to reset. Click the Reset button to complete MegaPlayer removal process. 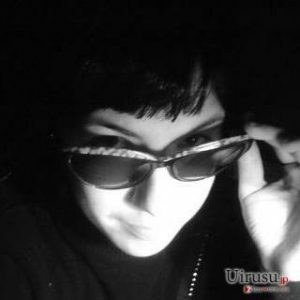 This entry was posted on 2015-10-12 at 10:26 and is filed under Adware, Viruses. You can quickly scan the QR code with your mobile device and have MegaPlayer manual removal instructions right in your pocket. How did you remove MegaPlayer?